A variety of techniques are employed to undertake monitoring of the coastline; when the coastal monitoring programmes started, levels and total stations were still in use, but were soon replaced with RTK GNSS (GPS) and, recently, increasingly by laser scanners. 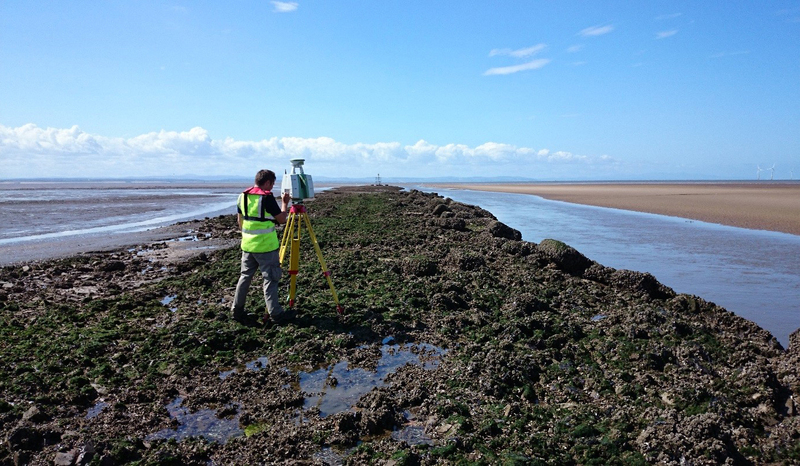 Topographic surveys generally cover beaches, dunes, cliffs, saltmarshes and coastal defence structures and aim to reach MLWS level where possible, while hydrographic surveys extend from the Mean Low Water contour to 1 km out to sea. 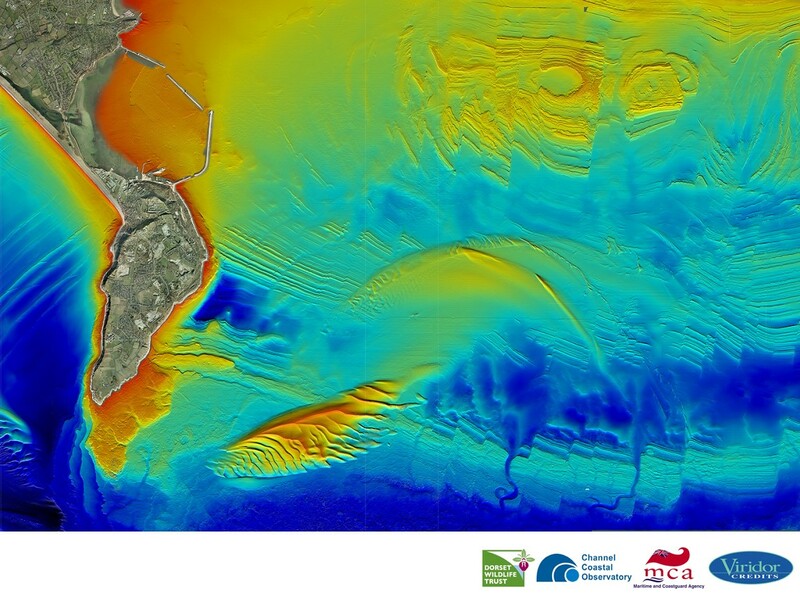 When combined with hydrographic surveys, a seamless surface from land to sea can be produced. Test points are measured at the beginning, during and at the end of the surveys to check that the survey fulfils the accuracy required by the Survey Specification. 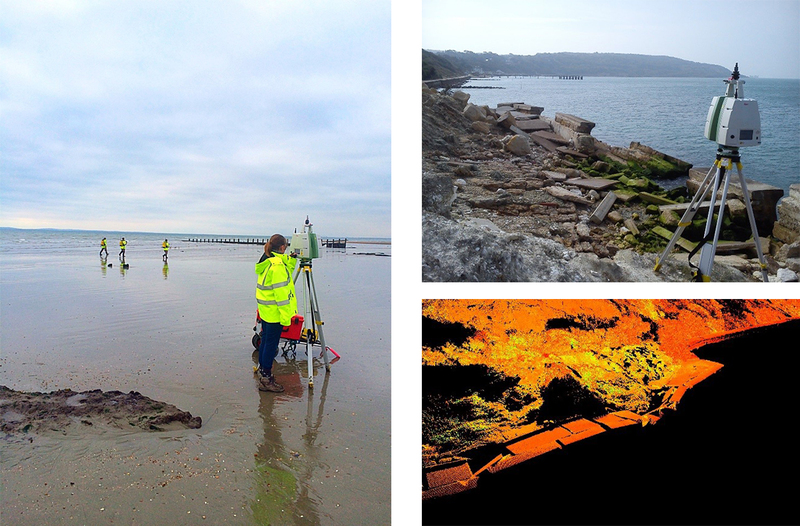 Laser scanning is used to survey large areas of beaches and cliffs with a very high level of accuracy and detail, typically millions of data points in a 150 m radius from the instrument. Laser scanners can cover large areas quickly and the data can be used to generate detailed surface models for calculating beach volumes. 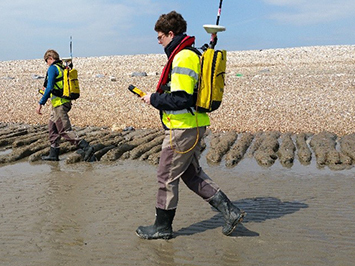 Topographic laser scanners cannot measure below water and are less effective over wet surfaces such as a mudflat recently uncovered by the tide, so in areas of beach close to MLWS or with standing water some walkover survey may be needed as well. Laser scanning is particularly useful for monitoring cliffs since (as a remote sensing technique) data can be captured from areas which would be either dangerous or impossible to access on foot. The scanner is able to detect very small changes in ground movement and is especially useful where there might be the potential for landslips or cliff falls. 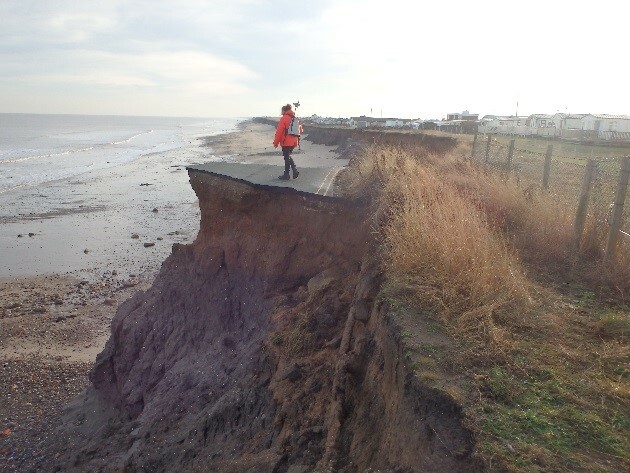 Laser scanners are being used increasingly for surveys of coastal defence assets such as seawalls to provide a high definition baseline dataset for coastal engineering applications. Terrestrial laser scanners can be either static or mobile types. Static scanners operate from a fixed position rotating through 360o collecting data of the surroundings. The scanner and targets are measured with GNSS enabling the resulting data to be co-ordinated to BNG. The process is repeated as the scanner is moved along the beach. In contrast, a mobile scanner scans only in the vertical plane but is usually mounted on an ATV, so is constantly capturing data as the ATV drives along the beach. The scanner gets its position from GNSS and movement is corrected for by an Inertial Motion Unit (IMU) within the instrument. 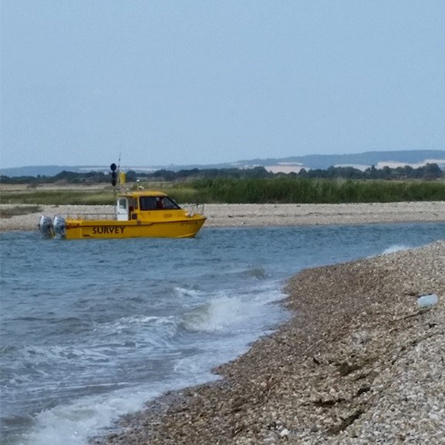 The mobile scanner can be mounted on a vessel, to capture areas which cannot be accessed from the beach cliffs or saltmarsh. Single beam echosounders are well established as a means of collecting bathymetric data and are particularly well suited to very shallow coastal waters. A pulse of sound is emitted vertically from the echosounder and the time taken for the pulse to leave the vessel, hit the seabed and return can be converted into distance providing the speed of sound through the water column is known. A “bar check” is done to calibrate the echosounder for the speed of sound in water column at the time of the survey. There are also instruments which can measure the sound velocity profile through the water column. 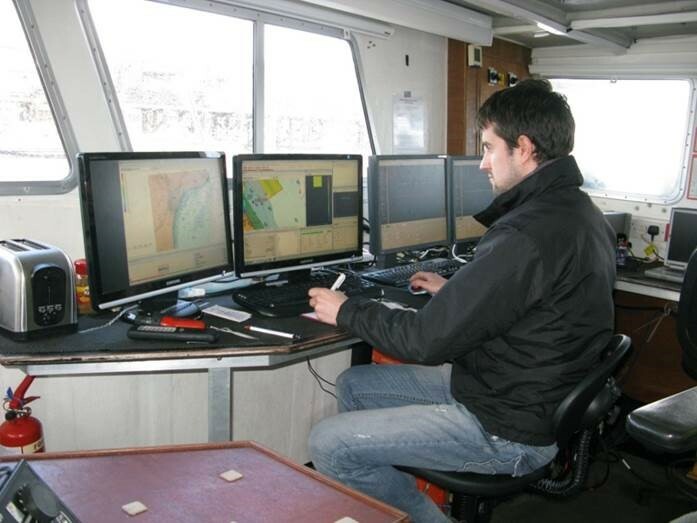 As the vessel moves along a transect, measurements of the distance to the seabed are collected continuously thereby measuring a bathymetric profile similar to a beach profile. Multibeam systems emit a swathe of sound beams and therefore can collect high volumes of data very quickly, to enable 100% coverage of the sea bed. The vessel crosses the survey area, typically parallel to the beach, ensuring that each swath overlaps the previous run. Due to the complex nature of these systems, they require highly accurate motion compensation systems and regular sound velocity profiles to produce good results. Data processing is also complex and can be time consuming, but the results of a well-conducted swath bathymetry survey can have myriad other uses such as nautical charting or seabed habitat and substrate mapping. 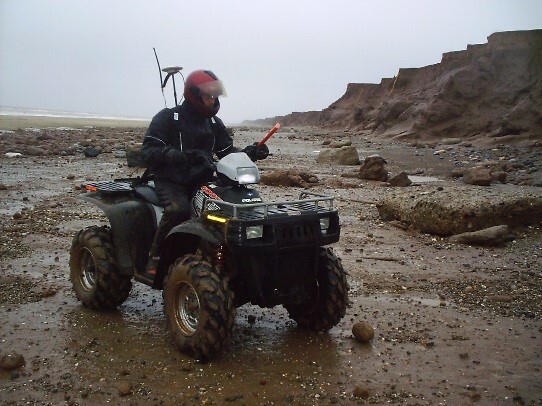 NetSurvey’s multi-beam survey of the Holderness Coast on behalf of East Riding of Yorkshire Council.